For the drinking enthusiast looking for a DIY but too timid to try homebrewing or making gin, we’ve got a project for you: Grenadine. 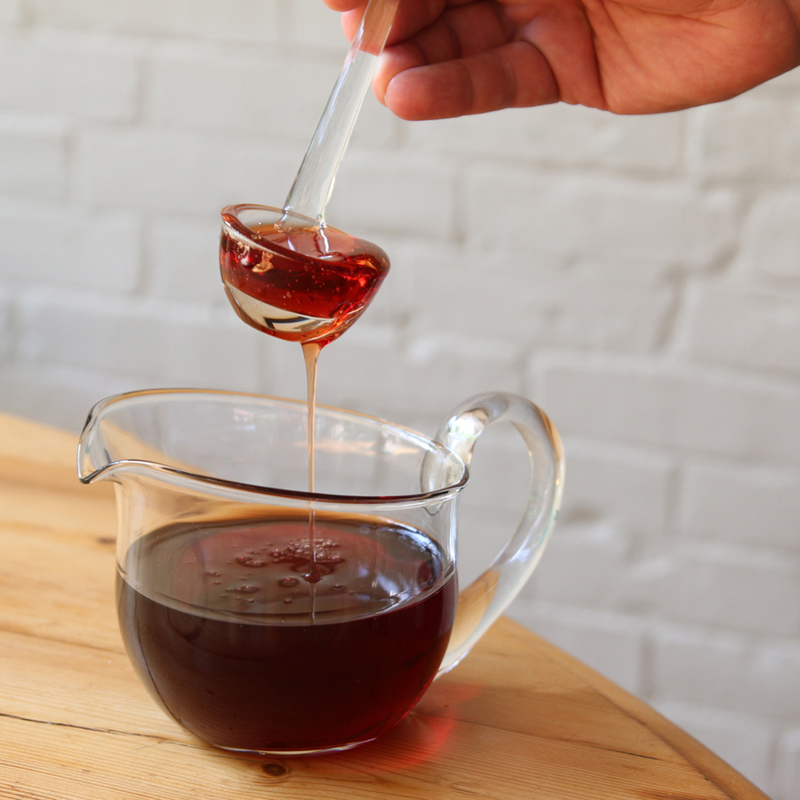 It’s almost as easy to make as simple syrup; meaning, there's no excuse not to make your own. Essentially just a reduced pomegranate syrup, grenadine is a workhorse of an ingredient. It adds sugar, acidity and a gorgeous color all at once. It's a great ingredient for rum punches and tiki drinks. And the best part is, once you've made grenadine—which you can do hours, or even days in advance—you've done all the heavy lifting. From there, the cocktails practically make themselves. To make the grenadine: Start with 100 percent pomegranate juice—not the kind cut with other ingredients or with added sugar. Pour one cup each of juice and white sugar into a saucepan. Bring to a boil, stirring to dissolve the sugar. Once it boils, reduce it to a simmer and cook for 15 minutes, stirring occasionally, then let the mixture cool. It should thicken considerably as it comes down to room temperature. And hey, look at that: You’ve made grenadine. It’ll last at least a week or two in the fridge, and pretty much forever in the freezer. You can also throw in big strips of orange zest and a few cloves while it's simmering (strain those out at the end, obviously). But this dead-simple basic recipe is a solid start. Grenadine and Coke: A childhood favorite. Jack and Coke: An adult favorite. Why not mash them together? No further explanation required. You know how good this is before even trying it. Instructions: In a tall glass with ice, combine 1 1/2 ounces Jack Daniels, 4 ounces Coca-Cola, and 1/2 ounce grenadine. Stir until well-combined and garnish with a lime wedge, or a few cherries. We have yet to discover a better summer drink than this one: lively, herbal gin plus in-season blueberries, with grenadine to punch up the fruit flavor. For the gin we like something classic and well-balanced like Plymouth. NOTE: Definitely double-strain this one, through your cocktail shaker's strainer and then a fine mesh strainer. Sometimes it's optional, but you don't want your friends walking around with bits of blueberry skin in their teeth. Instructions: In a cocktail shaker without ice, muddle 12 blueberries. Once you've squished them, add ice and 1 1/2 ounces of gin, 3/4 ounce of freshly squeezed lemon juice, and a 1/2 ounce of grenadine. Shake that all up and double-strain into a rocks glass with fresh ice. Garnish with a lemon wheel and a few more blueberries. This longtime classic has everything going for it: a boozy base cut with the fresh burst of citrus and the intriguing sweetness of grenadine. The original recipe calls for lime juice—we like a mix of lime and lemon, but either will work nicely. Instructions: In a shaker with ice, combine 2 ounces of applejack, 1/2 ounce of fresh lemon juice, 1/2 ounce of fresh lime and 1/2 ounce of fresh grenadine. Shake that all up and strain into a cocktail glass. Garnish with lime and lemon wheels.